Marriage Proposal Ideas Don't Have to be Classic to be Romantic, so Have FUN! If she loves animals, bring home a new puppy or kitten and tie the ring around the collar with ribbon. Go for a hot air balloon ride and propose as you're watching the sunset. Make sure you bring food and champagne and celebrate with a toast. Send her on a treasure hunt. Provide clues all over town to your favorite spots or just around the house. The last hint should lead her to you, with the diamond engagement ring in hand. Getting Engaged During a Holiday? 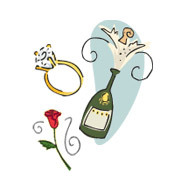 Certain holidays could be your inspiration to propose this year or next! Browse through our list of great marriage proposal ideas that have a seasonal or holiday based theme. Easter: Paint "Will you marry me?" on four eggs and place them in a basket with chocolate bunnies and eggs. Place the diamond ring in a box in the middle of the painted eggs. The Danforth Diamond ring box would look beautiful in this setting! July 4th: Propose at the finale of the Fourth of July fireworks. As an added touch, come prepared with champagne and wine glasses to toast. A Christmas Proposal: Decorate the tree with lights and only one ornament - a ribbon or bow tied around a Danforth Diamond ring box. Have a Christmas celebration for just the two of you. You can write out your proposal with roses in the snow or in Christmas lights on your house. Even make an advent calendar. Each door she opens should reveal a sentimental memory or reason you love her. On Christmas Eve, have the door open up to the engagement ring. Chanukah: Give her 8 nights of romantic gifts with the ring as the last night's gift. If she's a chocolate lover, a box of Kosher Godiva Truffles will always make her happy. Or, if you feel like getting creative, you could always dip real roses in chocolate and present her with your designed bouquet. Want to give her a personalized message? Give her a talking teddy bear with the message "I Love You". New Year's Eve: Why not start the year off with a bang? If you're at a party, work your proposal into the crowd's big countdown to the new year. At the stroke of midnight, tell her how much you love her and simply whisper, "Will you marry me?" Celebrate the rest of the night by sharing the news with all your friends. If parties and crowds aren't your thing, you can plan the ultimate at-home proposal for midnight instead. After a wonderful meal, cooked by you of course, retire to the candlelit living room for a romantic movie, or even the New Year's eve countdown. Even better...leave the television off, and ask her to slow dance to a favorite song. At the stroke of midnight or when the moment is right, look in her eyes, and ask. We hope these romantic marriage proposal ideas inspire you to propose in a way that is meaningful to you and your sweetheart.